This entry was posted in Racing on January 4, 2011 by Steve Tilford. Yesterday’s drive wasn’t too awful. It took about 9 1/2 hours to do the 700 miles. There were hardly any traffic slowdowns in DFW which was a pleasant surprise. I like the scenery on that drive. Oklahoma is a pretty nice state really. I bet most people haven’t put much thought into that, but it is true. Tulsa and Oklahoma City are both booming still. Lots of construction going on in the downtowns. Pretty progressive. 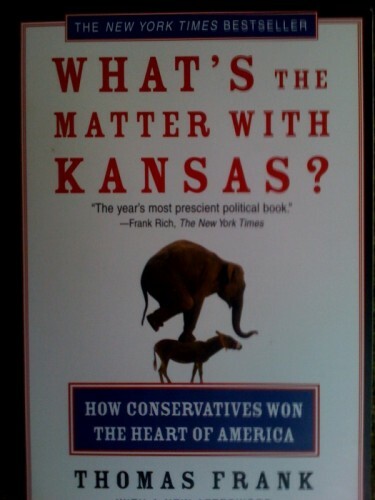 On Erik Tonkin’s suggestion, I’m reading the book, “What’s the Matter with Kansas”, by Thomas Frank. I’m not far into it yet, but it is hard to believe that the Midwest was a hotbed of liberal thinking not that long ago. It seems like the surrounding states are more progressive in their forward thinking than Kansas is right now. My Vet, Bryan Stancliffe, got me sort of hooked on the websites, Steep and Cheap and Chainlove, Bonktown, etc. All this did was cost me money. Thanks. But, I signed up for this new website, Groupon. I got interested in Groupon when I heard on NPR that Google had made a big offer to buy them and they turned it down. Groupon sends you emails that give you huge discounts on local stores. A couple days ago I bought $10 worth of JuiceStop drinks for $5. Today there is a 50% off coupon for a great restaurant in Lawrence we eat at sometimes. Here is the link to Groupon. If you sign up and buy something through this link, I get $10, so I really think you should do it. If you want. Okay. Enough of this silly indoor stuff. It isn’t super nice out yet, but it is nearly 60 degrees out already. I’m going to ride South to meet up with my friend, George McDiarmid, ride with him and then head back. It should be around 70 miles I’d guess. I’m just going to ride for a couple days, just to see how I’m going before I start training. It seems like a good idea, but in reality, it’s just being lazy. Pretty good book so far, but it takes a lot of concentration. 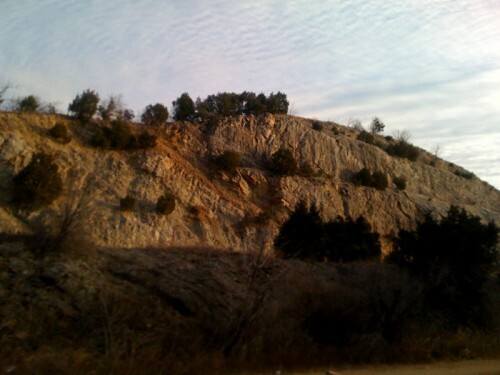 I like this small mountain range just North of the Texas line on I 35. 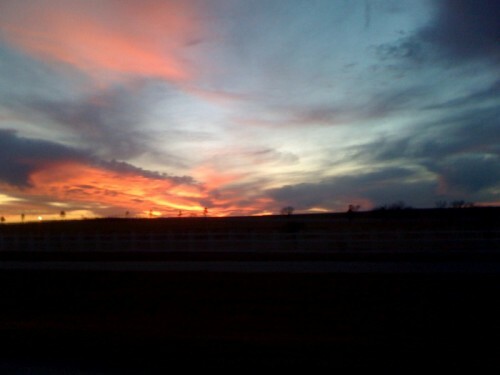 Pretty great Texas sunset last night. 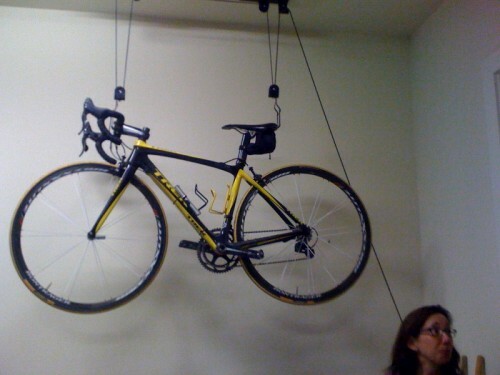 Ann's new bicycle pulley, storage, decluttering system, thing. Best Vets in the world. 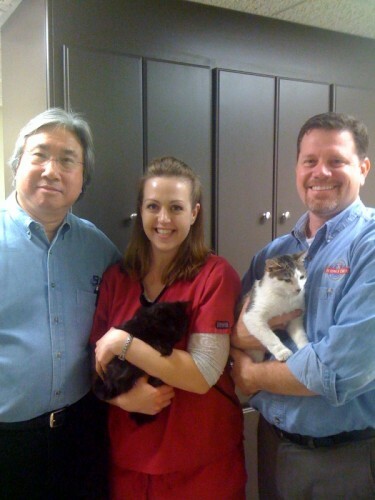 Dr. Tom, Dana, Dr.Bryan with Schnickle and Fritz. Enjoy your blog and have started checking in daily for info and entertainment. Thanks for taking the time to do it! Steve, you should spend a little more time in Nebraska. Especially anyplace other than Lincoln or Omaha. You would learn that Kansas is way more progressive than Nebraska. Nebraska is not forward thinking. Nebraska will probably pass an anti-immigration law like Arizona’s before 2011 is over. I came across some pics of you from back in 93 or 94 at the Vail MTB world cup race. I remember you lapping us at local races, probably still can/do. Sorry about the wet weather today. Predictions say it should be nicer next couple of days. Living vicariously through this blog at the moment. It is above zero for the first day in a while where I am. I’m relegated to my trainer in my basement probably for another 6-8 weeks.